meets the 2nd Tuesday of each month at 9:00a.m. "At the Tree Farm" behind Stuart Park. The public is welcome to join us. 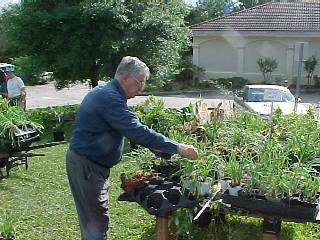 Titusville Men's Garden Club will have their Spring Tree and Plant Sale on Friday April 12 from 9 to 5pm and Saturday April 13 from 9 to 2pm. 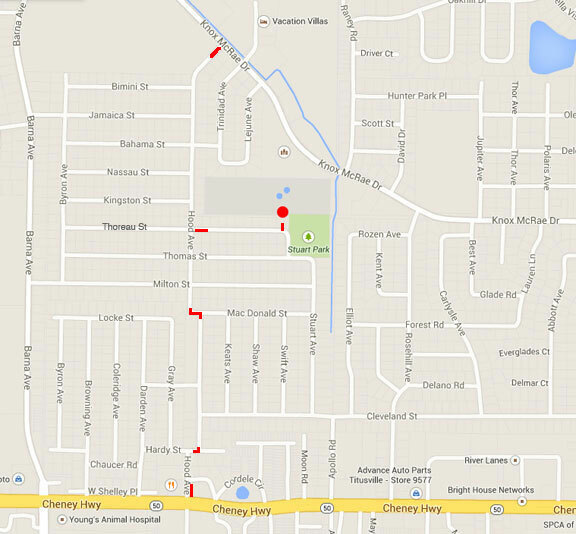 Location is near Stuart Park on Thoreau Street - signs will be posted. Some plants available are Agapanthus, Amaryllis, Azelea, Camelia, Canna, Ginger, Firecracker and many other perennials propagated by club members. Proceeds from the sale allows us to offer a $500 scholarship to college-bound students from Titusville and Astronaut High Schools and to give area grade school children a scholarship to Wekiva Springs summer camp. Master Gardeners will be the to offer advice and help with purchases. And Memberships will be available. Hey all you Flashy and Fearless Gardeners! !� You will not believe what's been going on at the Tree Farm!! New tables for our new crop of trees! New tables for the plants in the field! After 42 years the SHED IS BEING CLEANED and shelves are being built! All the guys have�contributed to all the fantastic things going on at the garden. Okay - just so you know - some of our devoted Tuesday regulars are having difficulties in�getting to the garden. Kat and Rick are having some car isssues. Patty is having back problems and Joanie has been ill with pneumonia and is in rehab working her way back�to the garden. Keep these devoted members in your thoughts. We hope everyone else is fine and we look forward to seeing you Tuesday!!! Thanks�for all the hard work!! Single member $25; couple is $45. Click on a picture to go to the enlargements. 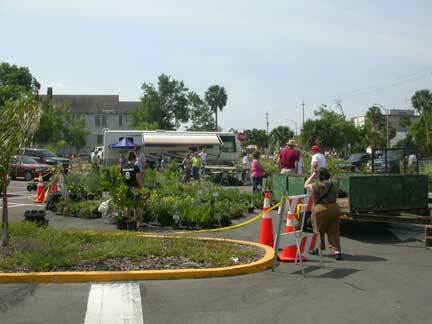 2006 Spring Tree & Plant Sale - Downtown Titusville Who we are: A non-profit Club that enjoys gardening and contributing to our City's beautification and our environment. What we are: As a part of the Florida Federation of Garden Clubs, we are a partner of the Titusville Garden Club. Where we meet: We meet on the 2nd Monday of each month at 7:00p.m. at the Garden Center, 5275 Sisson Road, Titusville (south of SR 50 - north of SR 405). We also meet at our "Tree Farm" near the Titusville Water Maintenance Facility. How we operate: We presently sponsor an April and October Tree and Plant Sale. The sales receipts are used to support the Club, purchase materials and donate plants to the City and other worthy non-profit causes. Some members grow plants to landscape their own homes (all are welcome to do so). 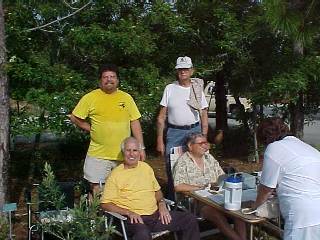 Members adopt trees and plants to grow and have fun. The members of the Men's Club hold both a Spring and Fall Tree and Plant Sale. Profits from this project go to purchase needed growing materials for the Tree Farm, which is an ongoing, year-round project. Some proceeds also are used to assist with Garden Club activities. Dedicated members, both men and women, work at the Tree Farm several days a week to keep up with the weeding, fertilizing, up-potting, propagating, etc. The majority of the horticulture stock comes from the Tree Farm, and is raised and nurtured by the members. Many of our members come to the Tree Farm on Tuesday & Thursday mornings for a few hours to care for our trees and plants; others come when their schedule permits. For a tour visit to our nursery facilities, please ask a member. We enjoy at least two dinner/social events per year. We have upcoming plans to include some field trips to nurseries and special places like Leu Gardens. Our monthly meetings provide great networking and fellowship, as well as enjoying some great speakers. We welcome visitors to our monthly meetings. Joanie's 2010 Gallery: Plant Sale and More. Enter from Hood Avenue and Thoreau Street. Click to open in a new window for printing.